At a launch that saw a credit card from the brand (called Apple Card, obviously), a news subscription service called Apple News Plus and a platform for original content named Apple TV Plus, Apple Arcade was unveiled with over 100 unique (read 'indie') titles, exclusive to Apple's devices, including Beneath a Steel Sky, a remake of the classic adventure game, with art by Watchman comic book legend Neil Gibbons. All these exclusive games could cost Apple a pretty penny, with some reports suggesting that Apple is set to spend over $500 million on the new service. Essentially, Apple Arcade is Xbox Games Pass for mobile devices. The thing is Apple has left us with more questions than answers about this new offering, so we've rounded up everything we know so far about the Apple Arcade subscription service. Apple said on stage that Arcade will release in "fall 2019", which means we can expect it to launch between September and November 2019. Apple has promised the service will be supported in 150 regions at launch. 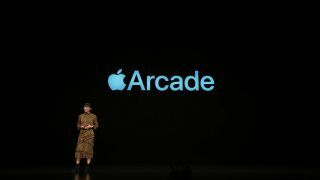 Ann Thai, marketing manager for the App Store, unveiling Apple Arcade on stage. Apple Arcade will be a single subscription service. Apple Arcade will give users access to over 100 games, all of which will be Apple Arcade exclusives, curated by experts and updated monthly. "You can try whatever you want, whenever you want," according to Apple. According to Apple, all the games on Apple Arcade will be available to play offline. The Apple Arcade service offers a Family Sharing plan so all household members can play the game for a single subscription cost. What's Apple Arcade available on? iPad, iPhone, Mac, and Apple TV. You'll also be able to pick up where you left off in a game, even if you switch devices. Apple Arcade games cannot collect any data about you without your consent. While we know that Apple Arcade will include games such as Sonic the Hedgehog, Beneath a Steel Sky and Where Cards Fall, Apple promises games from the likes of Bossa Studios, Cartoon Network, Annapurna Interactive, Finji, Giant Squid, Klei Entertainment, Mistwalker Corporation, SEGA, Snowman, ustwo games, Konami, Lego, and many more. The company is also contributing to the development costs and working closely with creators to bring their games to Apple devices. “The App Store is the world’s biggest and most successful game platform. Now we are going to take games even further with Apple Arcade, the first game subscription service for mobile, desktop and the living room,” said Phil Schiller, Apple’s senior vice president of Worldwide Marketing. “We are working with some of the most innovative game developers in the world to create over 100 new and exclusive games to play across iPhone, iPad, Mac and Apple TV. We've sadly not heard anything about the cost of the new Apple Arcade service, which hints to us that there are still negotiations going on with studios and developers over how the cost model is going to work. We would assume that either at WWDC 2019 or the iPhone 11 launch event we'll be getting more information here - given we're going to see Arcade at the tail end of the year, it's almost certain that more information might land around the launch of iOS 13, which traditionally happens in September.